Here are Nitara and Valentino catching up after a year. Long time, huh? 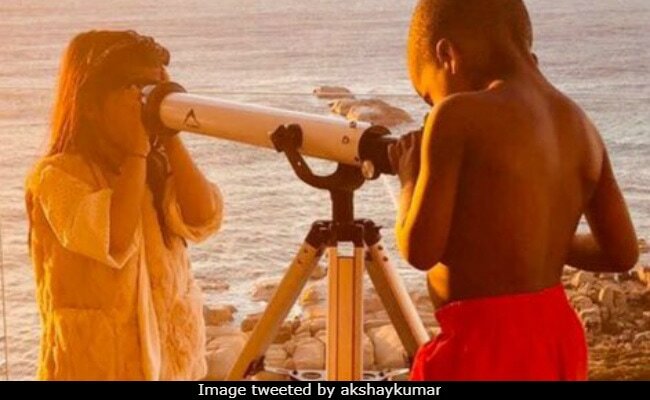 Akshay Kumar is back to his favourite holiday destination - Cape Town - and so is his five-year-old daughter Nitara. While Akshay Kumar and Twinkle Khanna may have been busy unwinding at their beachfront space in Cape Town, little Nitara quickly got busy catching up with an old friend of hers - Valentino. The name does strike a bell right? Yes, because the PadMan actor had adorably introduced Valentino - his house help's son in Cape Town - with a tweet in 2016, saying the little chap is "everyone's favourite in the house." And we can totally imagine why! His new tweet is yet another example of one of the most DAD things ever and reads: "Happiness Is... meeting an old friend and starting exactly where you left off :) Nitara meets Valentino 2.0.."
Akshay Kumar and company are in the Capital of South Africa to celebrate Twinkle Khanna's birthday - Mrs Funny Bones will blow out 43 candles on December 29 this year. Twinkle's last birthday celebrations were also with a close-knit circle of friends in Cape Town. Happy Birthday week, Twinkle Khanna and we are looking forward to pictures from your big day! Twinkle coincidentally shares her birthday with her superstar father Rajesh Khanna, who died in 2012. Akshay Kumar's Cape Town vacay is a break from his promotional duties for PadMan. Directed by R. Balki, the movie is produced by Mrs FunnyBones Movies and also stars Radhika Apte and Sonam Kapoor. Once back from Cape Town, Akshay will presumably resume his PadMan duties, which is slated to hit screens on Republic Day.